Playson are fast becoming a recognised name in the online slots uk market, and it’s for one reason. Their games are amazing. Fruitful Siesta takes place in a sleepy continental village where the cloud rolls by and not a lot gets done. Nevertheless, the game board is just as simplistic, featuring basic star symbols and a nod to the traditional fruit machine symbols of yesterday. Play this online slot game today and earn some lovely cash prizes. Playson is a well-established software company with over 250 staff worldwide. Their games use innovative technology with advanced high definition graphics. Playson offer a complete gaming solution for all your gaming needs. You can learn more about Playsons games here. 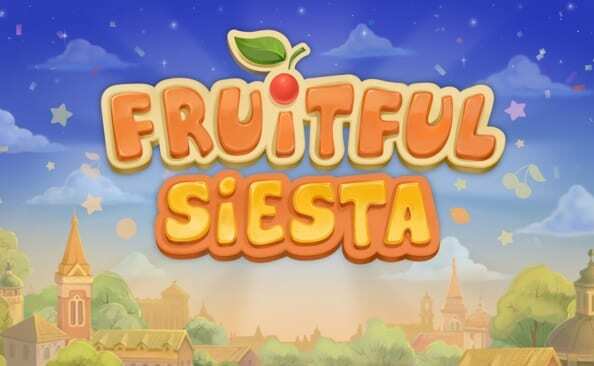 Fruitful Siesta is one of those classic games with a modern twist, so you can forget the fruit machines of old with this latest fresh addition from playson. 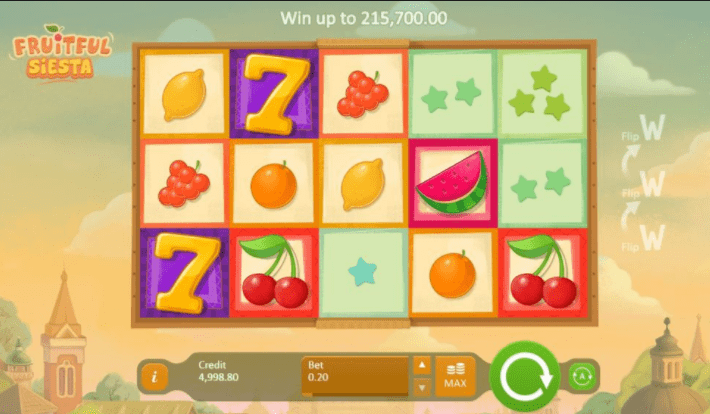 Fruitful Siesta has some unusual features, such as the ability to play both ways alone the payline. This means that as well as lining up symbols from left to right, you can also win by moving from right to left as well! Thus greatly increasing your chances of wins! This bright and colourful game brings summertime to life with the reels lined with fruity inspired symbols, such as oranges, grapes, watermelons and cherries. There is a pleasant summer skyline depicted in the backdrop, along with a cheerful relaxing tune. This adds to the games overall bright summer theme and will be a clear favourite among those looking to chill out and enjoy the tranquillity of summer. Fruitful Siesta is a 10 payline online slot, with 5 reels and 3 rows. Players have a wide choice of betting options ranging from 20p to £100. The new exciting Flippy Wild feature allows players the opportunity for bigger and better winnings by substituting all of the other symbols. It also sets off a flip, which remains in the same cell. The Wild will then freeze in position and all of the other symbols flip over to reveal potential winnings! The Flip feature flips over landed symbols changing the payout into one symbol. This means for example that all fruit symbols will change into the same coin symbol to achieve big wins! The Flip feature has three levels with a bonus re-spin between each level. You can proceed to a new level when you land a new Flippy Wild. The higher the Flip level, the higher the payout opportunity! Fruitful Siesta does not offer progressive or collective jackpot wins. Fruitful Siesta also enjoys a 95.44% RTP (Return to Player). This relaxing summer themed slot is also 100% compatible with all mobile devices with mobile-optimised gameplay. Fruitful Siesta is a fun summery game with attractive graphics and will make you want to kick back and enjoy the summer breeze. The game has some really cool new features, such as the Flippy Wilds, which adds to the excitement and thrill, as well as increasing your chances for wins. Click here to find more slot games.